I happened to reach the ripe old age of twenty in October 1939, was called up in December and automatically swept into the net of conscripts for the services in January 1940. My big brother Sydney, in his navy uniform, saw me off at Paddington and he – of all people – cried a little when I steamed out of the station. On D-Day I was a corporal attached to the headquarters of the 27th Armoured Brigade. As the invasion approached we moved to camps in the south of England. We were suddenly ordered out of camp all in a huge rush onto the landing craft and we sailed overnight to find ourselves approaching an unknown and deserted beach early in the morning. Everybody was tense, but the beach happened to be English and this was yet another exercise. Exercise over – back to camp. At the end of May we were restricted to sealed camps – no home leave or leaving camp permitted. No talking to civilians or telephone calls. We spent our time studying weird maps and strange coastlines. We learned expressions in German, polished up our French and learned to swim with full equipment on. I was promoted to full corporal and had to work on Brigade HQ as an assistant to the Staff Captain who was supplies officer. At this time all our tanks and vehicles were being sealed off with bitumen and nine foot long exhausts and inlet pipes were fitted to the tanks, while crews were equipped with Davis Escape Apparatus. Of course, none of us had a clue when the invasion would happen. It was a strange waiting period with everybody very subdued and acting over friendly. Last letters were sent home all written on a printed form and each one censored. Thousands of landing craft were now waiting patiently for us off the Isle of Wight and elsewhere for the Americans. Apparently thousands of dummy craft had been set up further east to confuse the enemy into believing a landing was to take place in the Pas de Calais. On 3 June we embarked and stayed on the craft. On 5 June at 5am we set off again this time for Operation Overlord. Thousands of landing craft as far as the eye could see in the semi-darkness. The sea was doing its very best to turn over every landing craft. We rolled every which way and it got worse. Luckily for us the German lookouts and observation posts in France had relaxed – their High Command was positive that no army in its right mind would set out to sea in a storm such as this. Our Brigadier, G E Prior-Palmer, was on board our LCT and as we sailed or rolled towards SWORD beach a Motor Torpedo Boat came within hailing distance well clear of our bouncing craft and the MTB commander shouted some instructions through an old-fashioned megaphone to the Brigadier. I had not seen my brother Sydney for some years since he saw me off to join the army when he was a naval lieutenant, but mother had written to me to say that he was now a lieutenant-commander and that he had his own ship. I had no idea what type of ship he had, that is until the incident above. It was my brother hailing the Brigadier of all people, of all places. Some years later, after the war when I met Sydney again he confirmed that he had been on Operation Overlord and that he had contacted a Brigadier on the lead LCT and passed on convoy and landing instructions. I had recognised him from the rear when he was on the bridge of the MTB. He just could not believe that I was right there within fifty yards of him. The Royal Navy suddenly let loose with all its heavies and to hear that lot whining overhead was quite an experience. What went through our minds? Firstly, let us get off these damn floating boxes onto dry land – nobody spoke, not even nervously. Have you ever felt really sick to the pit of your stomach and not been able to bring up any more? Well, multiply that by five and you know how we felt. I want to retch whenever I think of it today. The frightening thought in the back of my mind was that the Germans might well set the sea on fire when they discovered us. But right up to the time when the navies opened fire they just did not have a clue. It was, without a doubt, the greatest and most superbly organised operation ever. Thousands of landing craft with hundreds of thousands of men on board, thousands of tanks and guns with all the supplies. The whole of the allied navies behind us – then the massed fighters and bombers going over to soften them up – and the Germans were taken by complete surprise after waiting months for us to invade – as Rommel correctly predicted, on the beaches of Normandy. Hitler did not agree with him and said that the invasion would take place further up on the narrower part of the Channel in the Pas de Calais. How did we feel when the beaches came in sight? Sea sick with all that was now flying overhead, both ways by this time, sea sick. Landing craft were being hit and brewing up or turning over, dumping their men and armour into the sea. DD tanks which had floated off their LCTs further out were having a very rough time and a number became waterlogged and just turned turtle and sank, their crews imprisoned with the weight of water against the hatch. Some craft were striking anti-invasion mines affixed to triangular metal girders in the sand. Our turn came, the ramp was down, our tanks were on the beach protecting the Brigadier. The Captain, his driver and I moved off into three feet of water and then onto dry land with waves buffeting us from behind. We were soaked. Vehicles and men were lying everywhere. Our vehicle was hit by machine gun fire but there was no serious damage. I think the kit we were carrying protected us. Mines and shells were popping off all around – it was a glorified Guy Fawkes show and it was a bit messy. Strangely enough I no longer felt sea sick! We climbed SWORD beach at a spot called Lion-sur-Mer and reached the first badly plastered lateral. Luckily for us the large guns at Ouistreham had been put out of action by the commandos before we arrived. There was so much red hot metal flying around by this time that sitting in a jeep waiting for the tanks in front to move forward was a risky pastime. We came to a sudden halt behind a number of vehicles on the road leading to Luc-sur-Mer and because a number of unwelcome shells were flying around we decided to quickly dig in on the corner of the sandy road. We jumped into a shallow dry ditch and with our trench spades dug away at the loose soil to create a trench we could at least sit in and keep our heads below ground level. Digging I found amongst other large stones a hefty piece of concrete with mud and pebbles attached to it which would not budge. I banged at it with my spade and kicked it with the metal capped heels of my boot a few times until eventually it worked free. My colleague and I picked up the heavy stone and lifted it over the edge of the trench and dropped it onto the embankment. Some minutes later all hell let loose when an ammunition dump nearby us was hit and heavy shells were buzzing all around us. A Royal Engineer sergeant – running to escape the heavies going over – tripped on it, cursed and said as he dived into the trench, ‘I must be the luckiest bloke alive today – that was a concrete mine.’ It could have gone off when it was first touched. Days went by with lots of heavy action. There was mine clearing with our Sherman flail tanks, which had a huge drum at the front with heavy chains attached and when the drum revolved at high speed the chains set off the mines and cleared a path for the attacking tanks through minefields. Lots of sniping and disposing of snipers. Lots of machine gun fire and slowly moving forward under constant interruption, never a dull moment. Our early tanks were equipped with heavy sledges which they towed behind. The sledges were as long as a tank and as wide but about two feet or so deep. Numerous plates were battened down on top and when removed disclosed fuel in jerry cans, food and ammunition required to advance. No supplies had yet been landed, only fighting vehicles and troops. Tanks operating on land normally have large supplies following behind the battle lines. When supplies were eventually landed the tank sledges, which were now useless, were pulled over bottoms up to cover fairly large trenches which we had prepared and we had a protective cover which made us feel quite safe. Our squadron HQ O-in-C had a trench like this prepared and he had erected his working tent on top of it in which he had his control office, that is until the heavy guns at Le Havre (not yet taken) got their sights on it. A shell was fired which hit the ground about thirty yards away but in line with the tent and riddled it with shrapnel. You can imagine how much was left of the O-in-C. When we got to him he was minced. We were now dug in on a ridge at a place called Hermanville. I had prepared my first real trench which I had made like an armchair so that I could sit down in it with my head just below ground level. I had a heavy tank tarpaulin which was to pull over the top and later that night I crawled into it feeling cold but quite safe. In the early hours I was awakened by somebody calling my name and I was instructed to take the jeep and go forward with the Captain to prepare an off loading site for a convoy of ammunition required for a tank advance the next day. Off we went – did our job and when we looked back the few miles to Hermanville ridge we saw a couple of enemy planes dropping anti-personnel bombs over the area in which we were camped. These were very nasty bombs which rained down a shower of tiny white hot squares of metal onto the troops or target below. We eventually got back to base and I found my trench and climbed in, dog tired – we had been awake for two nights in succession – and tried to sleep for the remainder of the night. I have no idea what time it was or even which day it was when I awoke, but I vividly remember my legs being soaking wet and very cold. In my half awake state I remember seeing streaks of light and my befuddled mind could not understand where the light was coming from. Then my brain started ticking and I realised that it had been raining all night, hence the wet legs and the rain had been leaking through the tarpaulin, which had been riddled with hot metal from the anti-personnel bombs dropped by Jerry. Had we not been called out that night I should have finished up well and truly mashed. Some of our tank crews were not so lucky. They had been used to sleeping underneath their tanks during the dry weather, but when the rains came overnight their tanks had bellied down on top of them in the soft mud, slowly trapping and crushing them. Later in the campaign in north-west Europe Bert Leech was wounded in the head by shrapnel from a German mortar bomb, but within a few days he was back at HQ with his head stitched and heavily bandaged. 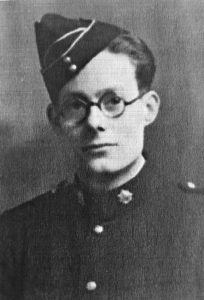 ‘In a week or so,’ he writes, ‘I was OK and by this time I knew that I was destined to get back home in one piece.’ He returned to civilian life in August 1946.